Tradewinds Suite is a luxurious honeymoon/vacation suite featuring a cal-king-sized bed, kitchenette, garden patio with outdoor dining, private Jacuzzi offering ocean views, outside shower, tiki garden leading to sauna room.... perfect for the ultimate honeymoon or romantic escape. Tradewinds Suite is the ground level of your hosts' two-story pole house. The private honeymoon Suite encompasses 1000 square feet of living area, including 30 feet of picture windows and a covered lanai. Floor-to-ceiling mirrors and soft cove lighting add dimension and an intimate atmosphere. There is an ultra-plush Cal-King-sized bed, a Queen-sized futon, and air mattresses are also available. Children are welcome. The full private bath has a shower/tub and a sauna which can be used with dry heat or steam. 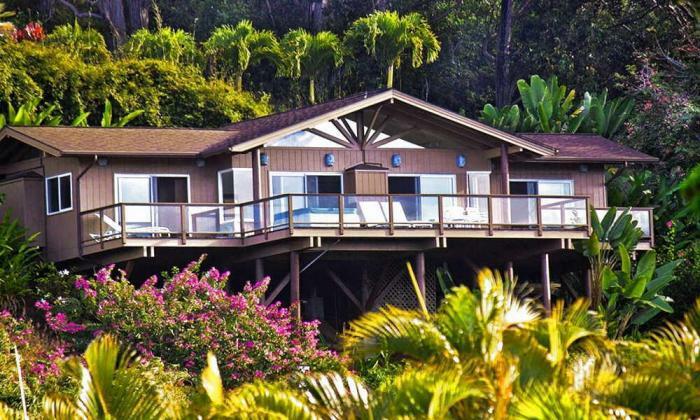 Here you will find beauty, comfort, convenience and privacy.The Suite is popular with Maui honeymoon couples. Your hosts, who are retired health professionals, are completely respectful of your privacy. Tradewinds Suite is suitable for two adults, but it could accommodate up to two smaller children in addition to the two adults, making a total of four guests. The tropical garden-patio has a barbecue, Tiki torches and a view of sunset over the ocean. Relax and enjoy exquisite beauty, tranquility and privacy. No other guests share your space or amenities.